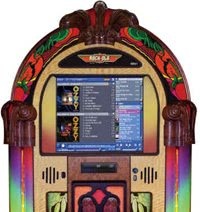 The Rock-Ola Gazelle Music Center is an exciting addition to the Rock-Ola family of finely crafted classic jukeboxes featuring cutting-edge music touchscreen technology! The Rock-Ola Gazelle is a stunning Art Deco style cabinet with bold graphics and colourful accents and the hand-crafted nature of this quality product can be seen in the way graceful beasts and horned gazelles appear to leap with joy on etched and illuminated glass panels that accent the centre grille. Custom printed arch panels and moulded wood crown and shoulders complete the slightly sassy Art Deco-inspired cabinet. The Gazelle Music Center represents the cutting edge of Jukebox technology with the latest 19 inch touchscreen with SATA tech and the exclusive Qsonix "drag & drop" system. There is also a new front lighting system that highlights the cabinet design and enhances the user screen, which this full-size cabinet is actually 5 inches slimmer than its CD playing equivalent making it a sleeker, more practical addition to your games room. This stunning design is matched by the sound quality achieved by a professional grade Peavey 1600 watt amplifier that powers up to two volume zones! 1TB of Storage can accommodate up to 13000 CDs. This stored CD information becomes an on-screen catalogue, allowing the music lover to browse a collection by Artist, Album, Genre, and more! Create and store multiple playlists with a theme - play a whole album or just a tune. Imagine all your favourite albums available for play at a finger touch!